I love Christmas cookies. They were, and still are, big in my house growing up. My father also loves cookies of all kind, but I think ones of the Christmas persuasion are his favorites too. My mom makes her usual repertoire of holiday confections each year and everyone has their own personal favorites. This year I set out to begin to create my own repertoire of celebratory cookies, candies and treats. I’ve made dozens and dozens of cookies and luckily many of them made their way to the annual church cookie sale so I haven’t been tempted to eat them all with a glass of egg nog. However I have made a good deal that will be given as gifts to family and friends and with that comes a reasonable amount of “quality control” taste test. Needless to say, I’ve had my fair share of christmas cookies so far this year and Christmas is still a week away. I’m going to highlight a few of my favorites this year for you to try out and add to you holiday cookie rotation. I’m going to start with a gingerbread cut-out recipe I came across last year but didn’t get to try out until a few weeks ago. It may sound strange but as much as I like cookies I don’t like them to be overly sweet. I like them to be full of flavor and depth. 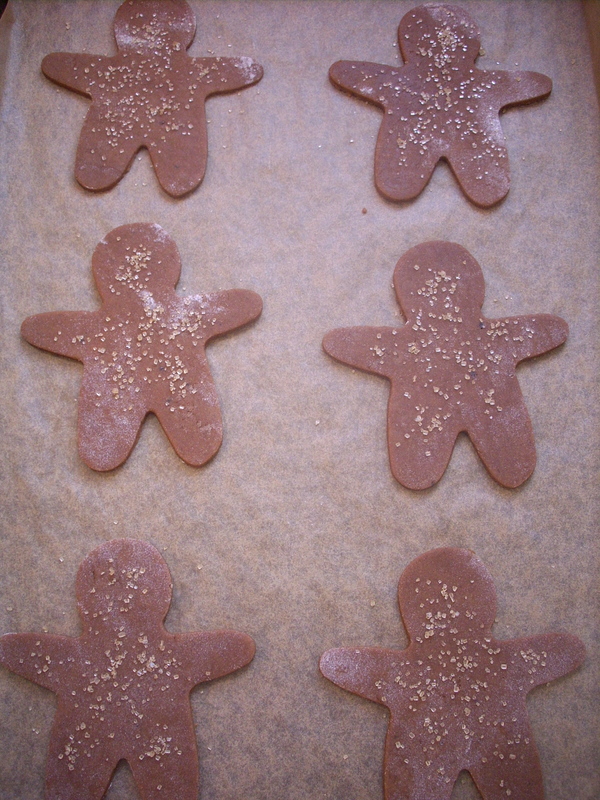 These gingerbread people are very deep cookies with a mouth full of flavor. They are quite wonderful when balanced out with a touch of sweet royal icing and a glass of egg nog! In a medium bowl whisk together flours, baking soda, salt, and spices including ground pepper and set aside. With a stand mixer fitted with a paddle attachment cream the butter until its light and fluffy. Add the brown sugar and continue to mix until its creamy and smooth. With mixer on low add eggs one at a time followed by the molasses. Slowly add the flour mixture. Mix until just combined. Dump out on to clean and lightly floured counter. Bring the dough together into one ball. Divide into to rounds, wrap with plastic wrap and chill in refrigerator for about an hour. Pre-heat oven to 350 degrees and line a cookie sheet with parchment paper. Roll dough out on lightly floured counter top to about 1/8th inch thick. 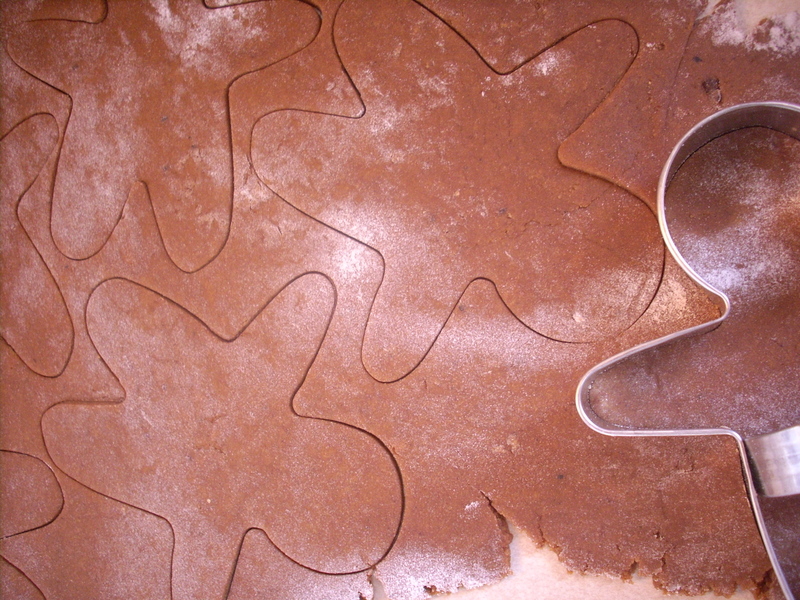 Cut into desired shape using cookie cutters, we used gender non-specific gingerbread people. Transfer to baking sheet. Bake for 7-10 minutes until fragrant. Adjust cooking time according to cookie size. This entry was posted in Cookies, Holiday and tagged Cookies, Holiday. Bookmark the permalink. I specialize in eating Christmas Cookies.